Lifelong adventurer Keith Bruce, a retired dentist, flies into his later years on a zip line and the belief that life should be a ride. Batman is flying through the air, high above the dense floor of the Nantahala Forest, his black cape flapping behind him. As he zips through the canopy at speeds between 20 and 25 miles per hour, he screeches in a voice that’s half-little-girl, half-kamikaze — and all heart. Video by Heidi Williams. Illustration by David Stanley. Video edited by Jonathan Weaver. When he lands on the platform, the group flutters in a collective chuckle. Some have just finished up a two-hour canopy tour with Bruce as their guide; others are preparing to head out on the ropes. They begin to disperse, and Batman unhooks himself from the carabiner, ending his flying for the day. Aside from the blue helmet atop his head and tangle of harnesses around his red polo shirt and faded jean shorts, Bruce looks as casual and relaxed stepping out of the air as he does getting out of his 35th-anniversary edition Camaro. In the sky or on the ground, he’s just along for the ride, enjoying life. That spirit spills off of him, and it seeps into anyone who rides with him. “You have to have a sense of adventure,” Bruce told me when I first met him. We were discussing the psychology behind why one would choose a demanding and dangerous career in retirement, when there are gardens to till, grandchildren to spoil, and antique car clubs to join. Turns out, he does all of the above, too. He is a father of four and grandfather to 11, custom woodworker, vintage car collector, and avid gardener. But in his second year of working with Nantahala Gorge Canopy Tours at Wildwater’s Nantahala Gorge Adventure Center, he is also more than twice the age of the other canopy rangers. He’s an extreme retiree. Indeed, zip-lining encompasses the trifecta of extreme sporting attributes. First, there’s the speed — zip liners can travel up to 25 miles per hour. Then, there’s height — at Nantahala Gorge, the tallest platform is 60 feet above the ground, and the tallest line is 80 feet high. And finally, there’s the specialized gear — the full-body harnesses, leather gloves, helmet, and an all-important auto-locking carabiner. But Bruce didn’t get his nickname riding the cables. And it’s not a reference to the old comic book character, the 1960s-era television show, or even the shared superhero name Bruce (Bruce Wayne). Batman is nicknamed Batman because of bats. A long time ago, Bruce and his wife, Beth, were raising their four children in Iowa. He was a full-time dentist, and they bought a derelict 1898 Victorian home and decided to renovate it themselves. It was a mess, full of misadventures. But the most notable came when they were sleeping. The Bruces would wake up to a middle-of-the-night fly-by from a bat. Several lived upstairs with them. After a few flying elbows from Beth, Bruce got rid of the winged friends. Sometimes, he’d be forced to catch them late at night, prompting his kids to give him the nickname, Batman. Years later, after Bruce cleaned his last tooth, he and Beth moved to western North Carolina from Florida. They were looking for a place to retire, so Bruce had no intention of joining the Nantahala Gorge Canopy Tour as its most senior ranger or tour guide. But he did, and at the end of his first season with the company, his fellow canopy rangers learned of the nickname and the story. His wife convinced him to wear a cape. “She’s always the instigator,” Bruce says. The character he plays is just one of many perks in his late-life career. “This gives me a chance to interact with people from all across the country,” he says. We are midway through the Nantahala Gorge Canopy Tour, deep in the heart of a part of western North Carolina that includes the Joyce Kilmer Memorial Forest, Ellicott Rock, and Slickrock Wilderness Area. Bruce is telling a story — one of many that he’ll share with me and my group throughout the afternoon — about the Native Americans who occupied this thickly forested part of the world before the Trail of Tears. I’m with two other women, and we’re excited, but bordering on panicked. We clutch, in various fashions, the trunk of a tall, not especially thick, white oak tree, trying to ignore the obvious fact that we’re perched high above the forest floor and being asked to jump off a tree-trunk-launch-pad into the great abyss. Bruce and his cohort for the day — a 20-something who goes by the nickname Blue — stand at the edge of the wooden platform, the tops of trees just beyond their shoulders. Were Bruce to glance back, or any of us to peer down throughout our zip line tour, we’d be looking somewhere between 30 and 80 feet down to the canopy floor that Native Americans explored more than 10,000 years ago. But the altitude fazes Bruce not a bit, and his casual conversation with Blue distracts our shaky group into relaxation as we tour the forest from a high wire. Bruce might do the tour two or three times a day now, and he might work two or three days a week. “I like to be outside, and as my kids say, I can usually tell a story,” he says. That combination makes being a canopy ranger a perfect fit. He spends most of his time entertaining. He tells a story about how this mountain range has a sister mountain in northern Africa and how at one time it was as high as the Himalayas (both true). There are lessons about the botany of this deciduous forest and the historical significance of the people who once called this land home. Bruce’s partner today, Blue, is 29-year-old Jared Smith. He had to set down his banjo to take the tour. He explains that the name Blue came from playing an old mandolin for hours on end at a popular watering hole; before too long, his palm, pressed firmly against the old instrument, turned blue with oxidation. Now he endures jokes about being Robin to Bruce’s Batman. The only difference between the two tour guides — other than the 42-year age gap, of course — is that Blue wears oversized aviator sunglasses and Batman wears his cape. 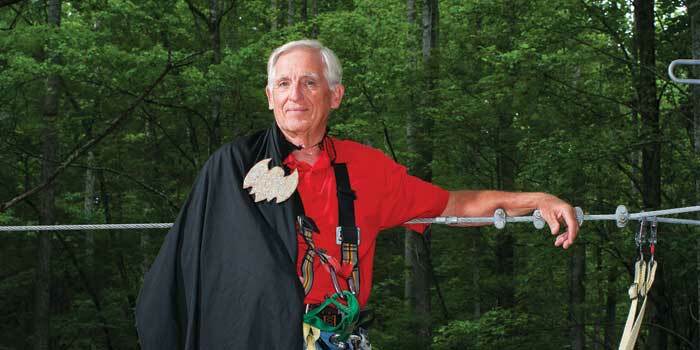 The Nantahala Gorge zip line opened in July 2009, and Blue was one of the first employees. That makes him Bruce’s senior, which they both point out with some bemusement. In the two years since the zip line’s grand opening, the popularity of the tour has swelled. During high season the center provides 16 tours a day. Last year, 16,000 people zip-lined here. Wildwater has the well-earned reputation as a destination for the young and young at heart. Camping, white-water rafting, canopy tours, and Jeep tours are just a few of the pursuits offered at Wildwater’s Nantahala Adventure Center. The canopy tour portion of the operation opened after Wildwater executive Jeff Greiner, the son of the company’s founder, Jim Greiner, spent time walking the land and envisioning the path of the tour’s 11 different zip lines and handful of aerial bridges. Jeff sees value in hiring people of all ages. “It’s all about the experience,” Greiner says. Blue on the banjo. Batman in his cape. These are the things visitors remember, long after the thrill of zipping fades away. Bruce’s zest isn’t exclusive to the zip line. He doesn’t just garden, for example. He videotapes the different parts of his yard as they come into bloom — partly so he will know what’s what during dormant off seasons, but also for posterity’s sake. His vintage cars fill two garages. A sprawling wood shop supports his furniture-making habit, a trade learned from his father, who was a postal worker by day and do-it-yourself woodworker the rest of the time. Bruce’s woodwork is a window into his meticulous, driven nature — from the curio cabinets he built for Beth’s Precious Moments collection to a six-foot-tall, oval dressing mirror that serves as the signature piece in the master bedroom. The pieces are museum quality in their shape and form. Now, he’s in the market for an old log cabin — the kind that you might see half-cocked, abandoned, and ready for the bulldozer, sitting behind someone’s house. He’d like to break it down and bring it back to his house, where he’ll rebuild it and use it as an attractive, utilitarian garden shed. As he describes his vision for this old shed he doesn’t have yet, his wife just laughs and shakes her head. Beth has seen that look before, and she’ll see it again. With Batman, there’s always another adventure. For more information on how to set up a canopy tour adventure or to make reservations, visit wildwaterrafting.com/nantahala.php, or call (828) 488-2384. Heidi Coryell Williams’s work has appeared in Resort Living; G, The Magazine of Greenville, S.C.; and MAMM magazine. She lives in Clemson, South Carolina. Heidi’s most recent story for Our State was “Keeper of Things Great and Small” (April 2011).